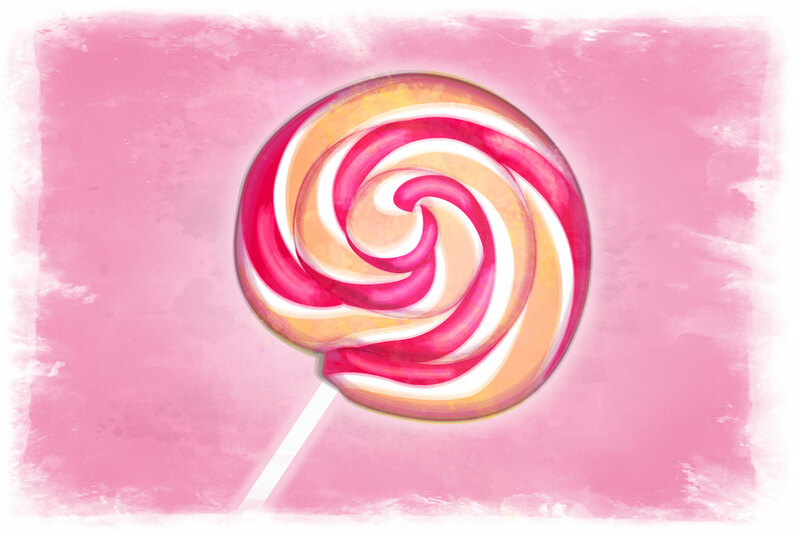 Android Lollipop brought many improvements, but people are also criticizing certain UI decisions. Why is it that even Google makes bad UI sometimes? First, let’s take a look on an example of one UI improvement in Lollipop. Position of the volume slider is one thing which personally drove me crazy when watching YouTube videos on Android 4.4 KitKat (apparently, it’s not just me). It was placed across the top part of the screen where usually the most important things are happening, for example, where the face of the show host is displayed. Face perception is very important in social interaction. Just imagine the person you’re talking to has their face covered. Even though watching a video isn’t a mutual interaction, it’s still a very unpleasant distraction for the viewer. Check out the image below to see how the slider looks like in Android 4.4. In addition, the volume slider in KitKat was displayed for a quite long time – about 3.5 seconds. 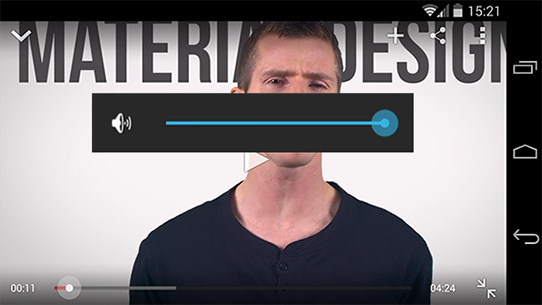 Obviously, the amount of distractions depends on how often you need to adjust volume in a video, but in certain situations, the slider can cover the video for a significant amount of time. It seems that Google UI designers realized this, or simply listened to the users feedback, and moved the volume slider in Android Lollipop. The slider is now placed on the top part of the screen, leaving important content uncovered. It’s also displayed only for 2 seconds, causing much less distraction overall. Google clearly stepped up the game with its Material Design concept, now becoming a leader in UX/UI, something difficult to imagine a few years ago. Material Design documentation is a very inspirational reading for any designer, not only those who design for Android. After all, Google challenged themselves to create a “single underlying system that allows for a unified experience across platforms and device sizes” and without a doubt they succeeded in many fields in Lollipop. However, even with such a successful turnover, there are certain UI choices which can hardly be understood. Whether it’s the spartan power menu or quick-settings drop down menu which cannot be swiped down at once, these are UI decisions which are not reasoned even in such prescriptive design language as Material Design. I’m always wondering how bad UIs are created in companies which have theoretically unlimited resources to hire the best experts, do extensive user testing, etc. Remember Microsoft and their unfortunate mix of desktop and touch-oriented UI in Windows 8? So here is my list of reasons which can play a role in making bad UI decisions in big companies like Google, Microsoft or Apple. I’ll demonstrate some of these ideas on the example of the volume slider from the beginning of the article. Of course, there is also the possibility that something is perceived as a UI problem only by a reviewer or non-significant amount of users, but for now, let’s assume we are talking about real UI problems which upset most users. This reason is less probable, but cannot be ruled out for sure. It’s a well know fact that when you design your own system, whether it’s an application or web site, you become so familiar with it after while that you are unable to see it with the fresh eyes of a new user. This reason assumes that the team behind the UI knows about a potential problem, but there might be an authority in the team or the company (art director, lead designer), who pushes a bad solution forward. Similar to the Boss authority, but now the whole team is convinced about their truth. If you have ever been frustrated by a certain Google decision with their products and never get an answer to your complains, you know this might be possible. Once the design team decided to go somewhere, they follow direction (like Material Design specs). Maybe you think it wouldn’t hurt if the volume slider is semi-transparent, so it obstructs the view in Android 5.0 even less. Alas, material cannot be transparent. 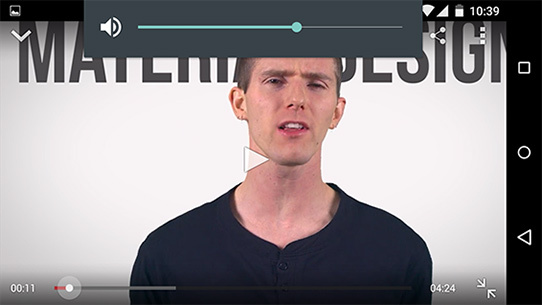 Some people who adjust volume strictly by hardware buttons wouldn’t mind if the volume slider is a very narrow line in the status bar just indicating the volume level. But since Android is a touch UI, the volume slider needs to be operated by fingers as well. UI is then a result of compromises where you try to do best but cannot please everyone in every situation. You do your best, do a lot of user testing and yet some things escape your attention as developing a new version of an OS can be an enormous task. However, for example, the Power button is such a crucial element that it’s very probable that its oversimplified functionality was a deliberate decision. Three not so nice reasons and three “nicer” ones. I’ll admit I have no insight into internal workflows of these companies, so my conclusions are highly speculative. What do you think might be some other reasons for bad UI solutions? Feel free to add your own explaination. You can dropdown the full quick settings menu by swyping down with 2 fingers ! Hum, you're forgetting deadlines. Unlimited resources doesn't mean unlimited time. And hiring more and more people to speed up the process, will just slow things down. All very good points about why Android UI fails. All comes to a simple problem "complications"
Simplicity. Smartphone should be simple like the old phones even non IT people can use it. Why make specifications just because you are a big company. Everyone knows the menu button is for menus and now google decide to swipe. Swipe also conflicts with apps that need to pan by swiping. Many other problems like bad colours and non consistent UI. Interior decorators knows about colours not material design.